I'm so excited for this upcoming weekend! I wanted to do a post about what to expect at the Crafters' Ceilidh meet-up. 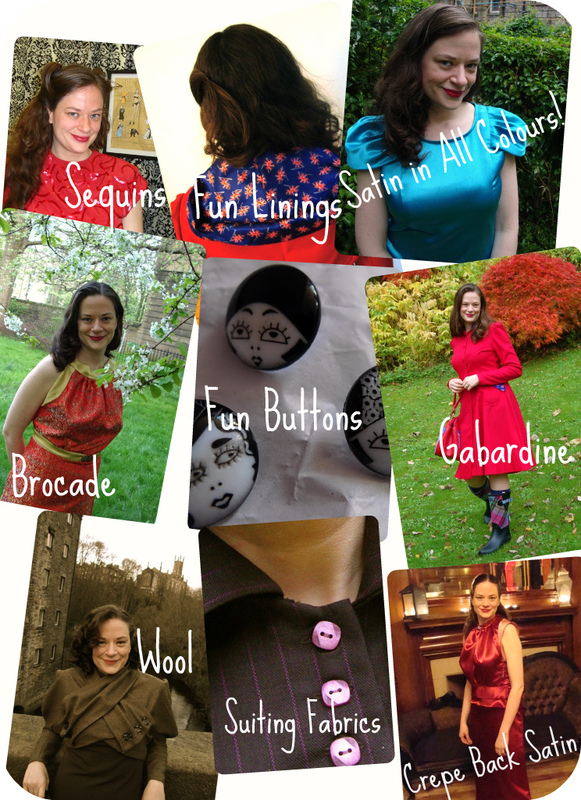 Those who are coming will be receiving an email soon with all the details but I thought I do a little showcase piece on some of my favourite sewing related offerings in the beautiful city of Edinburgh. Now, it's no Goldhawk Road or Garment District....but we've got a few Aladdin's Caves with hidden treasures. I know I am horrible at spur of the moment shopping and prefer to plot and plan a little before my fabric and sewing related excursions--so I thought I thought I'd share some photos to get your creative ideas flowing! Edinburgh Fabrics is small and jam packed with goodies. I always find something new every time I visit. Some of my favourite things they offer includes amazing British wool (at good prices approx. £15-20/mtr), crepe back satin in virtually every colour, fun buttons (including rhinestone vintage looking buttons), loads of trim, beautiful Chinese brocade fabrics, great linings and some beautiful netting (think petticoats) in nice muted colours. Edinburgh Fabrics is family run and I think you will love it! 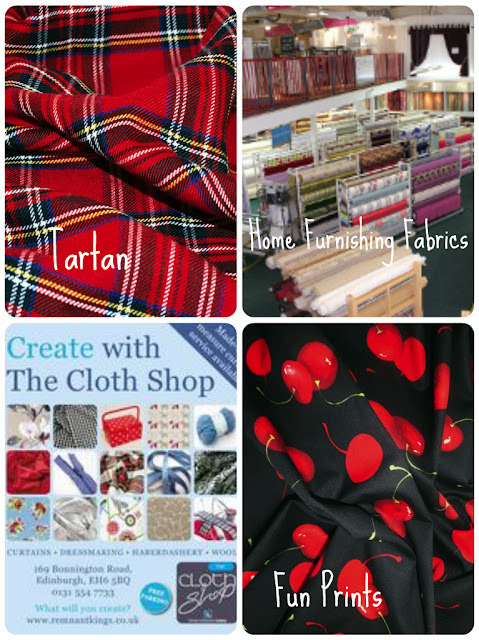 Looking for home furnishing fabrics, fun stretch tartan fabric or funky prints? The cloth shop is a great store. I never know what I'm going to find but I always love having a look! They also have accessories such as shoulder pads, etc. Fancy knitting? K1 Yarns Knitting Boutique is a cute little shop with some very nice yarns. They also have a short stack of wool fabric and batik print fabric in the store (though it's a bit on the pricey end). 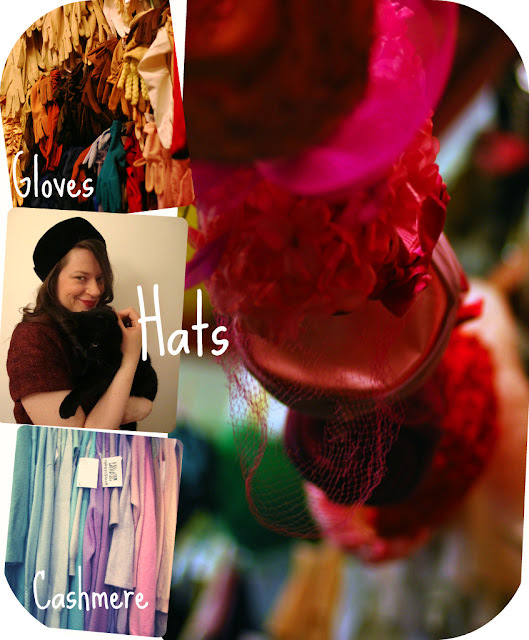 Photo credits: Gloves and hats photos from La Poubelle Verte, Cashmere sweaters photo from Rosie and Gracie Vintage. Armstrongs and Sons is THE place in Scotland for vintage clothing. Some of my favourite things include their vintage hats, gloves and of course, cashmere jumpers/sweaters. They also have vintage patterns and fabrics. Every time I've gone, I've walked away with some fabric at a fabulous price (in December I came away with three yards each of two separate wools!!) Plus, the store is such a fun experience--it's packed from floor to ceiling with pretty things. I'm currently checking to see if any of these places will give us discounts. We'll probably do a bit of traveling by bus around the city (Edinburgh buses are fantastic)--so plan to bring £3.20 in exact change to purchase a day ticket. Unlike other buses in Scotland, the Lothian buses do not give change so you have to have the exact fare. If you have fabric, patterns, yarn or other crafty stuff that you're not using--bring it with you and put it in our swap! More details on the actual meet-up location and other logistics will be sent soon! I can't wait for Saturday!! Thank you for this post. I'm not coming to the crafters ceilidh, but I am going to Edinburgh in March and I will have a lot of time on my hands for browsing fabric and yarn shops! Wish I could make it to the Crafters' Ceilidh! 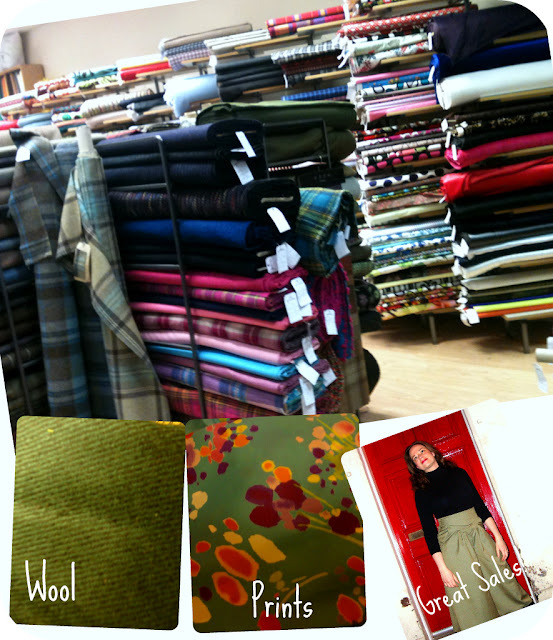 Have you ever been to the Dress Fabric Company in Bruntsfield? It's my favourite fabric shop in Edinburgh. It's absolutely tiny but the woman who runs it has a great eye for fabrics, everything she stocks is beautiful. Some of it is pricey but she also have cheaper fabric. I've found amazing fabric there I haven't seen anywhere else. You should definitely check it out. I buy something there everytime I go home to Edinburgh! Ha, ha, ha, ha! Can you imagine if I turned up in my North Face jacket? I think I'd be turned away from the Ceilidh. If people are feeling cold they can slip their hands into my cosy pockets. I can't wait for this meet-up, I may start having palpitations! Thank you so much for your wonderful organisational skills, all three of you. Fantastic post, thank you. I can't make it to the Ceilidh but will be going to Edinburgh later this year so that my panda obsessed eldest can see the Zoo's new stars! My sis-in-law who lives there is a knitting fanatic, so I'm sure she'll be taking me around the yarn shops (even though I don't knit), but this will be great for the sewing/ fabric side of things. OMG!! Saturday seems so far away. I can't wait. I don't have a very practical coat at the moment, so I shall layer like I have never layered before. oohh.....so excited now. I'm really looking forward to going into Mandors.I've heard so many exciting things about that place. I think I am about to have a panic planning attack - lucky I have 3 hours on the train to think about it! Have a great weekend sew-ers, so jealous I can't make it! so jealous. please take hundreds of pictures!!! Back then, I loved Armstrong & Sons. All their stores are great but the main one, at the foot of the hill, is a true Alladin's cave. I still wear the 1970's suede jacket I bought there. Weather permitting, of course. ....another fan of the Dress fabric Company here. I made a top from Missoni knit fabric purchased from this shop specially to wear to the CrafterS Ceilidh. However since I have had to pull out of the CC for family reasons, my top will be worn in Aberdeen this weekend instead ! Anyway I know that you will all have a fantastic time - looking forward to reading all about it on your blogs. Although not a blogger myself, i enjoy the blogs of quite a few of you planning to be in Edinburgh in Saturday. Have fun ! If you have another meet-up I'm definitely on the list but it's not happening this time around. Thanks for the list of fabric shops (as a new sewist). As an ex-student in Edinburgh (from a time when it was still in B&W) then Armstrongs is still on my hitlist when I visit. It's where my wedding dress came from and I didn't even think of going anywhere else! Enjoy your day on Saturday. Can't wait to see the pictures! I so wish I was able to come to this meet up. My friend is celebrating a big birthday this weekend otherwise I would be there for sure. So great to hear everyone's connections with Edinburgh! I just love it! I definitely need to check out the Dress Fabric Company...thanks for the information!!! So looking forward to this weekend!!! !